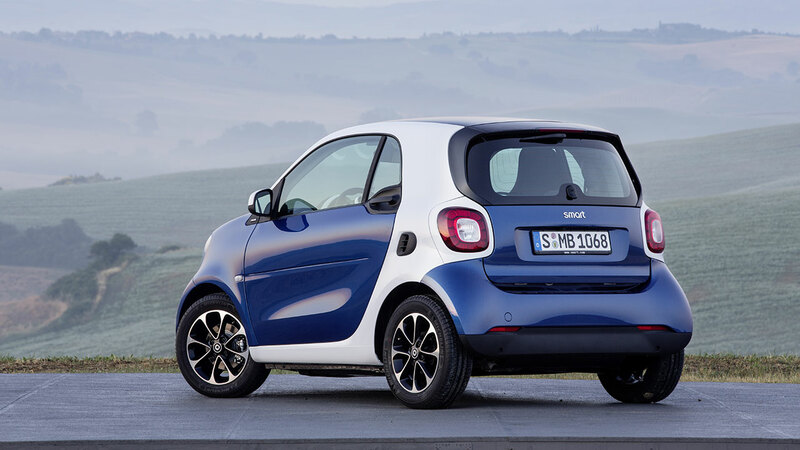 "As Europe's youngest car brand, smart enjoys global success today. No-one combines functionality and emotion as well as we do, as the inventors of individual urban mobility. The new smart fortwo and forfour adopt the proven concept while offering more of just about everything – more space, more colour, more equipment … and even more fun in the city! Only the vehicle length remains as unique as ever, at 2.69 metres," says smart boss Annette Winkler. "Our idea based on a total rethink of urban mobility has won through." 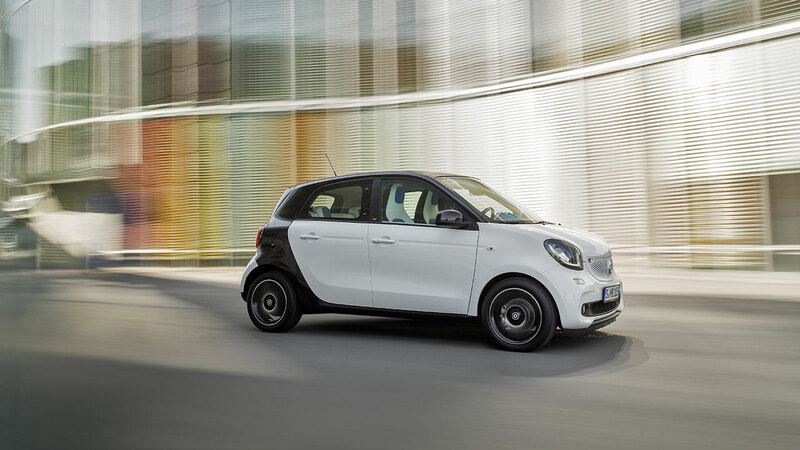 "In the planning phase we were clear that we wanted to retain the rear engine for the new smart, so as to continue to exploit the vehicles' strengths to the full in the city," explains Jörg Prigl, head of the product group Compact Cars at Mercedes-Benz. 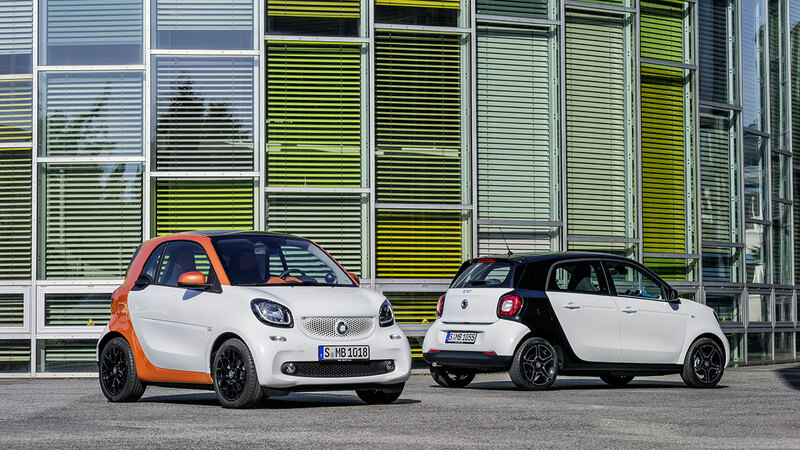 "On this basis, we then developed the new fortwo and forfour together with our partner, Renault." "Despite increased safety requirements, we have managed to retain the smart fortwo's unique length of just 2.69 metres," adds Markus Riedel, head of development at smart. 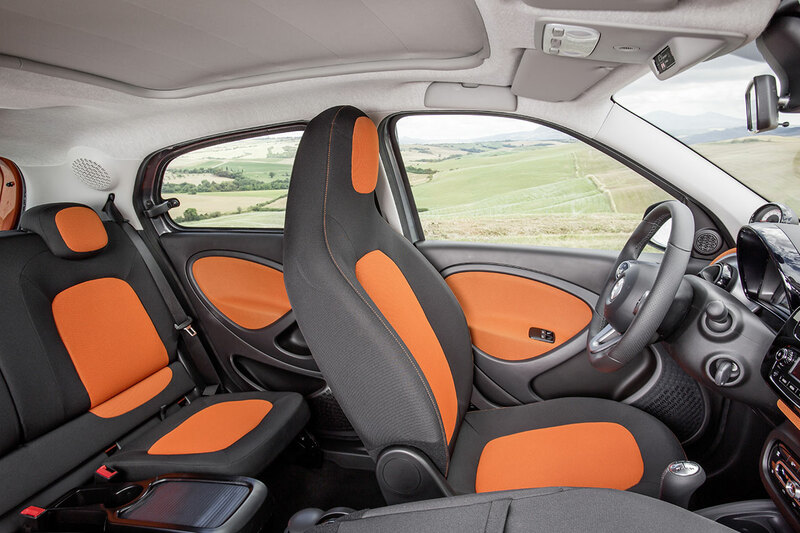 "It shares its architecture with the new forfour. We have tailored both of the vehicles to the needs of modern-day city traffic. My team is particularly proud of the turning circle, which sets a brand new benchmark at just 6.95 metres for the fortwo." "smart stands for FUN.ctional design, as the brand is defined by two poles – the heart and mind. The design idiom is clear, purist and trendy, and the hallmark smart attributes are being adopted into a new era. These attributes include the characteristic silhouette with the ultra-short overhangs, the clear lines and forms, the tridion cell and the updated smart face," notes Gorden Wagener, Head of Design at Daimler AG. The essential safety concept embodied so successfully by the preceding models has been retained. Like a nut, the soft interior is protected from harm by a rigid shell: the tridion cell. 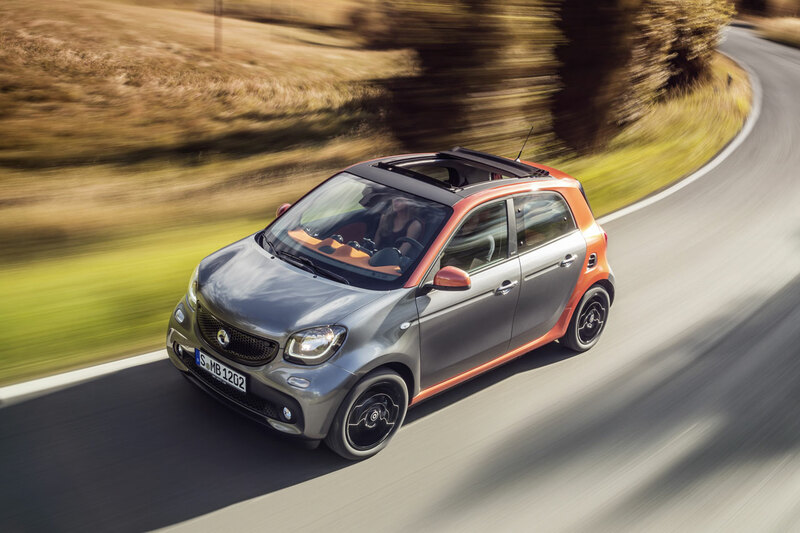 A high proportion of ultra-high strength hot-formed steels and maximum-strength multiphase steel is now used on the new smart. In keeping with the Mercedes-Benz "Real Life Safety" philosophy, the focus in car-to-car crash tests was on compatibility with substantially larger and heavier vehicles. The new smart vehicles performed well in frontal collisions with the S- and C-Class. Two state-of-the-art three-cylinder engines will be available for the new smart models at the market launch: the naturally aspirated engine generates 52 kW/71 hp from a capacity of 999 cc. The engine's ample torque from an engine speed as low as 1000 rpm (maximum: 91 Nm at 2850 rpm) enables particularly economical driving in high gears, even in urban traffic. Apart from the turbocharger, a whole range of other technical measures also contributes to the engine's excellent fuel efficiency and performance. These include variable swirl control and variable adjustment of the inlet valves. Another defining trait of the all-aluminium three-cylinder engine is the square bore/stroke ratio. A few months after the market launch, a basic petrol engine rated at 45 kW/60 hp will extend the range. The smart designers refer to the evolutionary development of the silhouette as the "one-and-a-half box" design. A change to the previous one-box proportions became necessary for two reasons: The higher bonnet lends the smart a more grown-up and sportier character. The smart sports a friendly but self-assured face. A decisive feature of this friendly face is the signature smart grille, which is now slightly larger. The grille's perforated structure results from a honeycomb pattern. The honeycomb is paler towards the outside - the designers refer to this as fading. The radiator trim is available in a variety of colours to match or contrast with the bodypanels, including black, cool silver and white. The second, black cooling air opening in the bumper also features the honeycomb pattern. 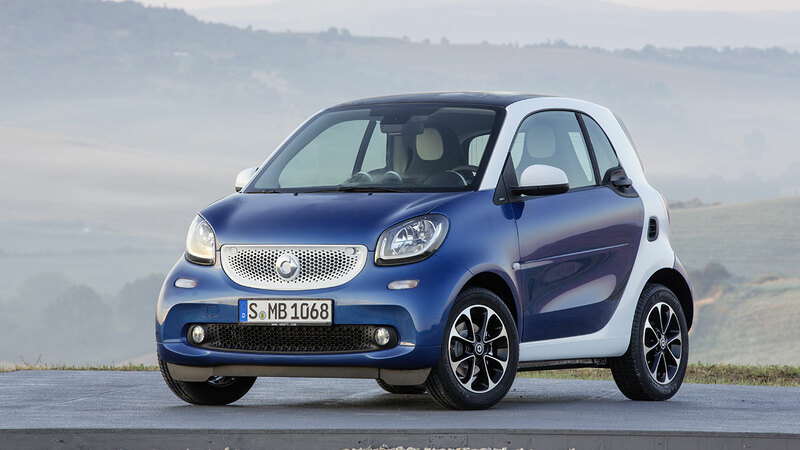 The markedly larger updated smart logo in the middle of the grille also demonstrates self-confidence. It is now three-dimensional and almost spherical in shape, harmonising with the smart's distinctly more sensuous lines. The logo features a matt finish rather than a high-gloss look, similarly to all the sparingly applied chrome accents. The side view of the smart forfour reveals the same elements as the fortwo, but has a longer tridion cell as well as the additional door. The front and rear overhangs appear just as short as on the fortwo. The forfour's roof line slopes downward towards the rear in coupé style. The twin-section tailgate is close to smart drivers' hearts. The new smart fortwo boasts this special feature once again, enabling the vehicle to be loaded even in the tightest parking spaces. New, rich exterior colours and around 40 combination options between bodypanels and tridion cell boost the brand's upbeat image. New colours now available include moon white (matt), lava orange (metallic) and hazel brown (metallic), which can be applied to contrast with new colours for the tridion cell such as cool silver (metallic) or lava orange (metallic). "Loop" is the designers' name for the emotional sweep that features as a leitmotif in the interior, embellishing the dashboard and doors, for example. The sculptural dashboard itself consists of two sections - a bold and sensuous outer section which can optionally be covered with fabric, and a large, concave inner section incorporating the functional elements. In front of the dashboard, the instrument cluster and the infotainment centre with radio/navigation appear to hover in front of the dashboard. The doors take up the "loop" of the dashboard with their ellipsoidal sweep. The large armrest provides for comfort. The honeycomb pattern from the exterior is cited on the integrated loudspeaker and the tweeter in the mirror triangle. Short overhangs, minimal length, high steering angle. The new smart models have everything it takes to manoeuvre elegantly into any parking space - and around every corner, too. When it comes to the turning circle, the new smart fortwo sets a new benchmark: at 6.95 m (from kerb to kerb) and 7.30 m (from wall to wall) it makes turning manoeuvres extremely simple. 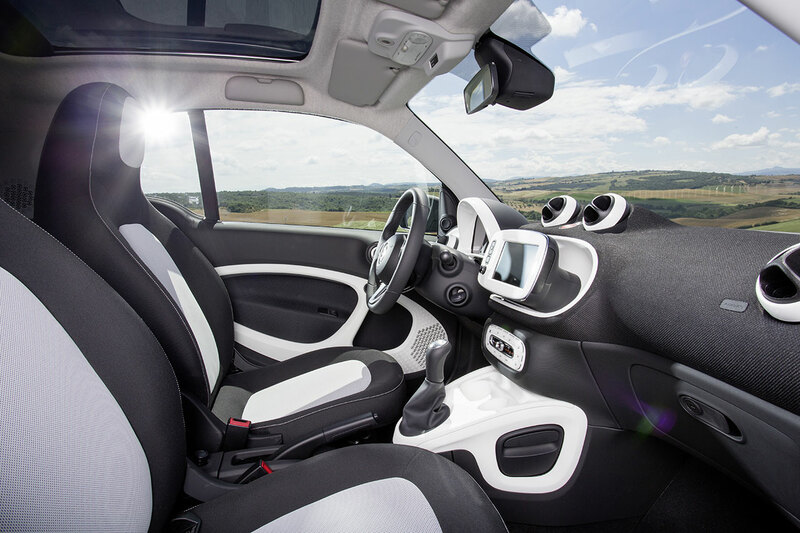 And the new smart forfour turns almost as compactly as the previous fortwo (wall to wall: 8.75 m). Its statistics are 8.65 m (kerb to kerb) and 8.95 m (wall to wall).